Running board and footsies installation and tips. for final delivery and brunch. We typically do this with a pick up and fill the bed. So, i probably need a few cargo bikes to make it easy. anyone? Meet up at Tiger! Tiger! is 9 am for the farmer's market and delivery ride. Bring a childs trailer if you have one. I'll bring a light weight trailer with a universal hitch. This Sunday at 9am we'll be doing our weekly Farmer's Market shopping all via bicycle. Typically we fill up the bed of a pick up every Sunday and deliver the goods to Panama 66, Blind Lady Ale House and Tiger!Tiger!. This week we're rolling cargo bikes instead. Join us at T!T! for a 9am roll out, maybe a quick stop at Nomad for fuel and then off to market. We'll shop for all sorts of fruits and veg with Chef Norbert and then make the deliveries. We'll have a couple cargo bikes courtesty of Jim Baross Jr and are encouraging others to join us for the ride to do their own shopping or just get a little exercise and some snacks. HOME STRETCH: Adams to 30th to T!T! Me strapping two boxes of 15 dozen cage free brown eggs from HIlliker's and a box of mixed greens from Suzie's farms. Super fun time. Hopefully another one happens before too long! p.s. we were joined by a parent (emmey) with two boys that was selling a red step-through mountainbike off of CL that they had added an Xtracycle free radical kit and Yepp car-seat + big kid handlebars to the back. The bike + whole kit was on sale on CL this week for $700. Looked good in person and successfully hauled 2 kids to the farmers market with us for the spur of the moment ride for them. It isn't current on CL but may get re-posted soon if you are looking for an xtracycle purchase! T: Not mine, but just passing this along! I'm selling our family's Triobike Mono bakfiets, which we custom ordered from Copenhagen, Denmark in November 2013, for over $4000. This is a modern bakfiets which has won many Dutch design awards. It is also the lightest bakfiets in the world. There are many cheap Chinese bakfiets knock-offs on Craigslist, but this is a true Dutch bakfiets, made to the highest Danish standards. It has a plush padded seat with 5 point safety harness seatbelts, a rain-cover/sunshade that can be popped up or down on a moment's notice, and an 8 speed internal geared hub for a very low maintenance bike. Perfect for getting around flat places (like Coronado) or add an electric motor for a couple hundred dollars and you, your kids, and your groceries can fly up any hill with ease. Cost over $4000 new; selling for $2500. XTRACYCLE is releasing the beta of their new "LEAP" this thursday. 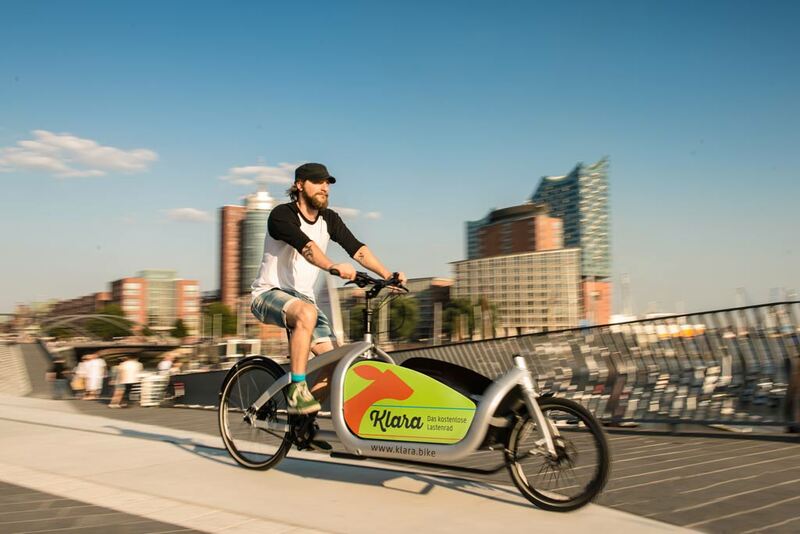 In Hamburg they experiment with gratis neighborhood transport bicycles. They can be booked for up to three days and are gratis. They are stationed at local bike shops, which maintain them and manage the reservations. There is this short clip from Hamburg tv. The bike is called Klara. It can carry up to 100 kilogramms. It is part of a joint 40 city feasibility study project with ESA (European Space Agency). They track the bikes´ routes on the ground and come forward with a heat map of the best itineraries for bikers. The transport bikes of the post office and courier services are supposed to run for up to 20.000 miles per annum - they too are part of the project. 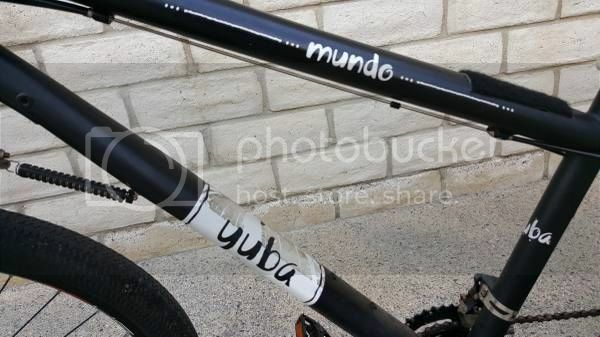 Not mine, but someone in Encinitas is selling an "XXL" size Yuba Mundo fully ready for the family and cargo bike lifestyle. $500 is an absolute steal. This bike is a beast. Steel frame. Can carry pretty much anything. I used to haul my wife and kid and beach gear to the beach. Great for the farners market. There s always parking in the bike rack. Has a fair bit of beach rust, needs to be gone over and tuned up by a pro. It is fun to ride. 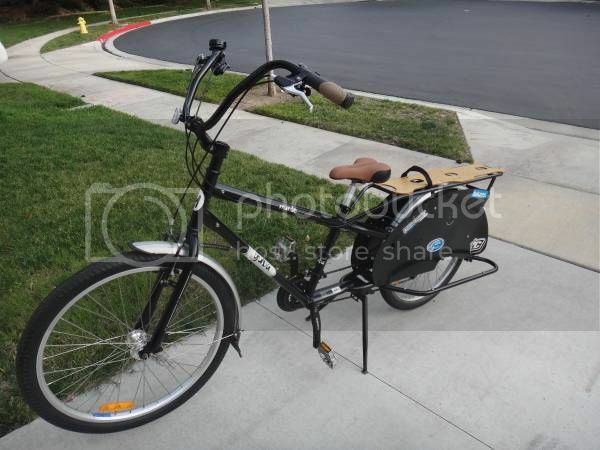 Another sub-$500 ($435) xtracycle being sold (not by me) in Long Beach on a Raleigh frame. Looks good! North County Family Bicycles will be bringing a couple of 2014-2015 Xtracycle Edgerunners at the Velodrome Swap meet on Sunday April 17. This is a 2+ year review of the 2014-model Xtracycle Edgerunner 27D long-tail cargo bicycle in the urban environment of New York City. In my usage it has been mostly a grocery bike and sometimes a snow bike, while I have intentions on using it also as a business bike (i.e. home-care therapist, etc.). 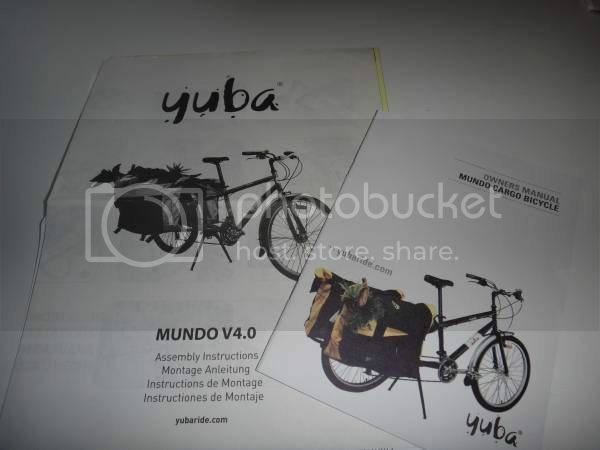 San Diego local resident uses Yuba Spicy Currie e-cargobike to get groceries. I like the simplicity of a big bin in the rear. 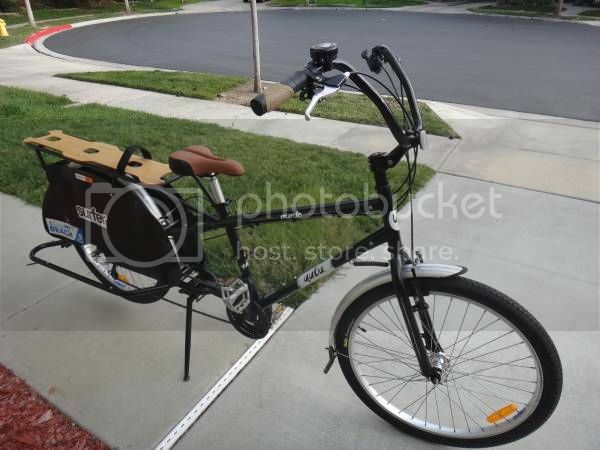 Not mine, but looks like a good deal on long tail cargo bike. This is a relatively light / fast cargo bike that makes a very good commuter, grocery getter and gym/court/park transporter. With 700c wheels and disc brakes, the Kona Ute might make a nice 650b conversion (wheel swap with 27.5 MTB? ), especially for shorter riders. 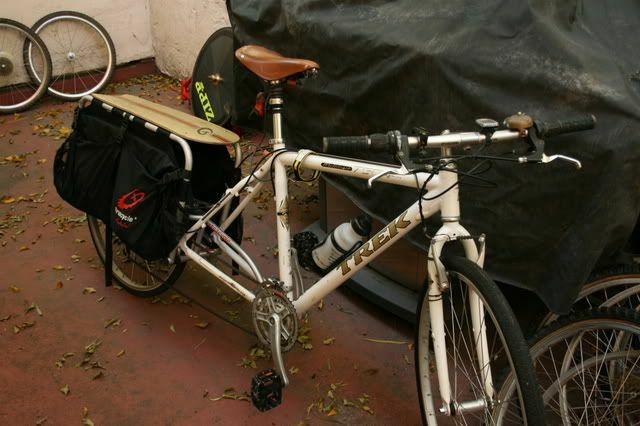 I have a similar design (Surly Big Dummy) bike that I have used for commuting and found it very versatile. The stability of the long wheel base becomes apparent on fast descents at night and the gearing allows for steep and patient climbing. Currently I use my long tail bike for errands and night rides. Velo Cult: post photos of your Cargo bikes and talk about them. ask questions about them here too. Sky Boyer, Velocult, had this Xtracycle sold it to a friend after he got his Surly Big Dummy. 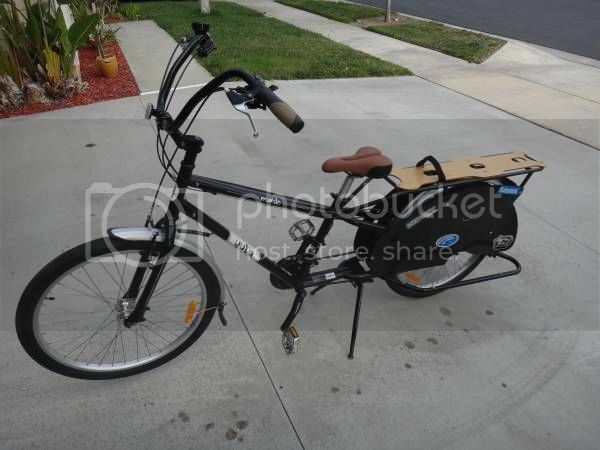 The owner is selling this Xtracycle in City Heights. After the farmers market, I stopped by the lumber store to get more 8 ft lumber (two 2x6, two 2x4, and four 2x2). We're adding another modular section to our garden coop. 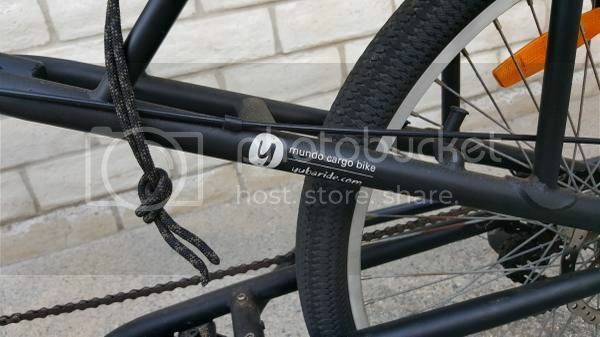 Lumber front ends were strapped to integrated front rack of the Cycle Trucks ‪#‎cargobike‬. To widen the loading capacity, I strapped two 2x2s to support the load to the frame. Getting ready to sell this MEDIUM size Big Dummy. Let me know if you are interested. My wife and I are content with the SMALL size Big Dummy. My co-worker Brian who lives in Ocean Beach is now a proud owner of a Surly Big Dummy. Say hello to him if you see him hauling stuff around town. So Brian's pre-loved Big Dummy is now ready to haul his Lobster hoop and gear. I guess there is a spot where you can catch lobsters in OB. Strapped onto the Cycle Trucks Beavertail is an Xtracycle Snapdeck with a Bike Friday Haul-a-Day Whoopee-Deux which I used to carry a 6 foot Douglass Fir tree. I'm thinking $450 is a lot for this... I'm thinking of asking $200, thoughts? The new Xtracycles should be coming out this spring, and a basic setup is around $500. 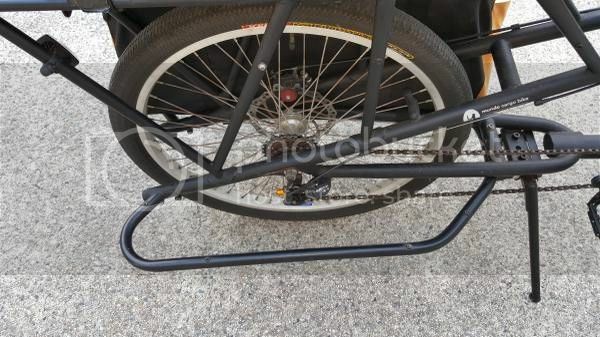 I'm selling a lightly used cargo bike. I got it new and the bike is in perfectly working condition. It has always been stored in garage. The add-ons installed are fender set, bamboo utility deck, and ramble strap. 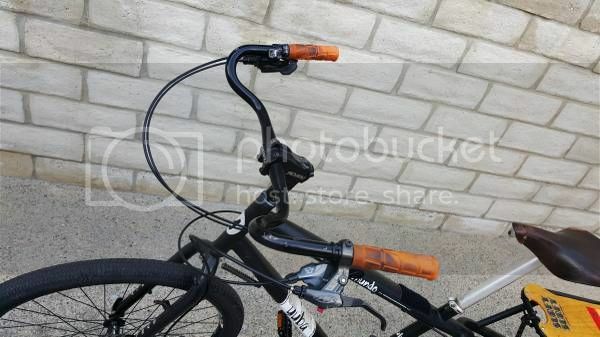 I also changed the handlebar to a more relaxing cruiser handlebar in black. Please email me with any question you may have. 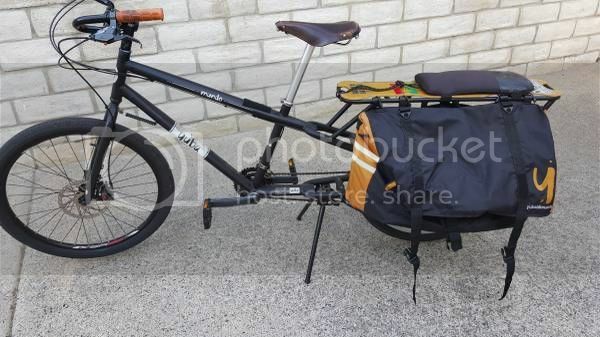 a friend is looking for a cargo bike for kid transport (twin 5 year olds and a 2 year old). likely just for the two 5 year olds. i told him to go to metro cyclery but he's also looking more towards used / CL / etc. let me know if anyone is looking to sell! Anyone know if "Larry Vs Harry: The Family" is available at any SoCal bike shops?